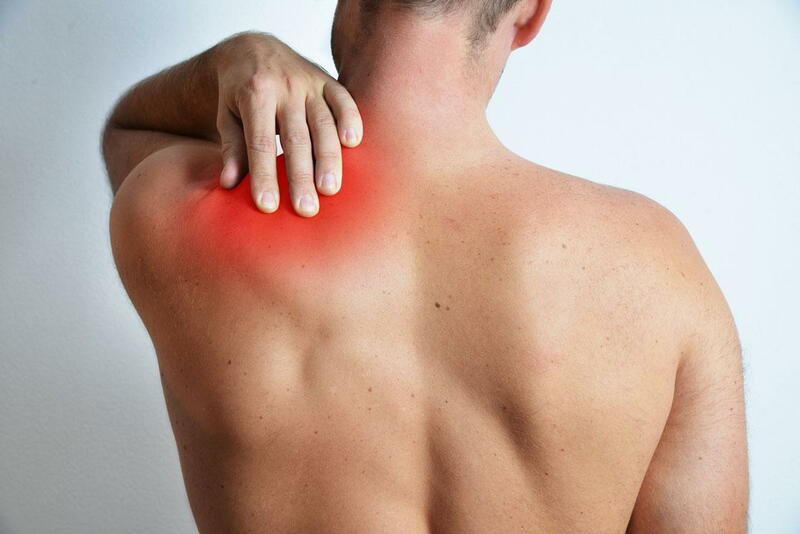 If you suffer from joint pain, you know how challenging performing simple tasks is. Even though it's somewhat counter-intuitive, the proper exercises can relieve some of your back pain, hip pain, shoulder pain or other joint pain. Try these moves to improve range of motion and increase flexibility. You'll feel better when you do them on a regular basis. Stand with your arms straight, hanging loosely close to your body. Then roll your shoulders forward 10 times. And then roll them back 10 times. This is especially good to do after sitting in front of a computer or at your desk. Stand with your feet shoulder-width apart, knees slightly bent, and stomach pulled in. Reach your right arm up and over your head to the left, sliding your left arm down your left leg to your knee.Then, lean into the stretch. (If you feel any pain, you're reaching too far.) Hold for a count of 10. Then return to the starting position and repeat on the right side. Stand behind and slightly to the left of a sturdy chair. Bend your knees slightly, and keep your hands on the chair for support. Slowly swing your left leg forward and then back. As you do, keep your back straight and try not to arch your spine. Repeat 10 times. Move to the right side and repeat 10 times with your right leg. This exercise is great for loosening up the hips and helps with walking and standing. Sit at the edge of a chair or bed. Straighten your left leg out in front of you and rest your heel on the floor or a small stool. Sit up straight. Then gently bend forward at the hips until you feel a gentle stretch on the back of your left leg. Hold for 20 to 30 seconds, breathing normally. Sit up slowly. Repeat on the right. Did you know that problems with your feet can affect your whole body? An improper stance caused by leg length, knee and hip pain or foot issues can cause imbalances in your spine, lower back and other parts of the body. Dr. Breiding uses x-rays and custom orthotic digital scans to determine whether or not his patients need orthotics. If they do, he can provide relief with custom orthotic inserts. If you have orthotics from Dr. Breiding, you know how helpful they can be. And now, for the month of March, we are having a reorder special of our Foot Leveler orthotics. Just call our Rhode Island chiropractor at 401-884-8687 or fill out our contact form online. Remember - we've always got your back!